Angel&Raven. 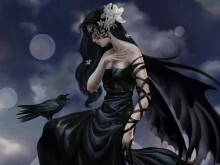 Because she is his Angel and he is her Raven. Wallpaper and background images in the Young Justice OC'S!!! club tagged: young justice oc fang devin. Yes. AND YOU SHALL NOT HAVE HER. That's because you could take Devin from me. ._. Actually, I like Becca sometimes. Lexi: *clinging to Devins legs* Mommyyyy!